Ruby glass was a staple at the Palace workshops. In Moss, Graham, Tsang, A Treasury of Chinese Snuff Bottles, Vol. 5, Glass, p. 18, it is suggested that during the early years of the Imperial glassworks, from 1696 into the early decades of the eighteenth century, it might have been a closely guarded secret, slowly leaking out to other workshops over time. With its ruby-red color and chi dragon design, so popular at the Court (see under lot 601) this handsome bottle is likely to be a product of the Palace workshops. 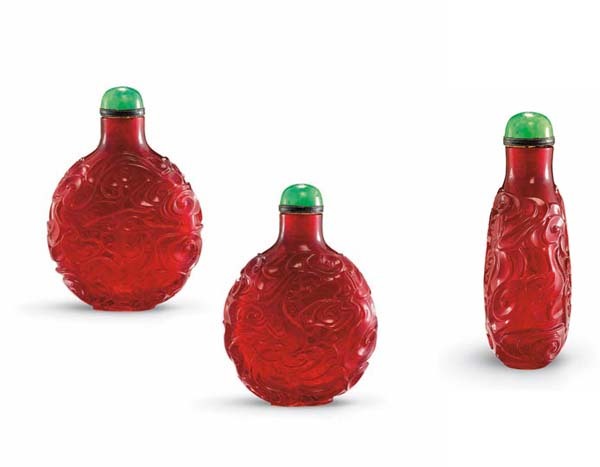 We can be reasonably certain that ruby-red glass was produced during the Kangxi and Yongzheng periods, but the absence of reign marks on so many glass snuff bottles does not allow us to differentiate between Qianlong and pre-Qianlong examples. This design was undoubtedly popular during the Qianlong period, however, suggesting the most likely date of production. Similar designs were also produced in other colors. For an example in green glass, see M. Hughes, The Blair Bequest. Chinese Snuff Bottles from the Princeton University Art Museum, p. 110, no. 119.